How Long Do Your Company's Checks Sit In A Truck Or Van Before Making It Into The Office For Deposit? Process Check Payments In The Field For Reduced Liability & Decreased Time To Receive Payments! Ideal Payment Solution for HVAC Contractors, Electricians, Plummers, Construction, Landscaping, Home Healthcare, Printing, Delivery Services & More! 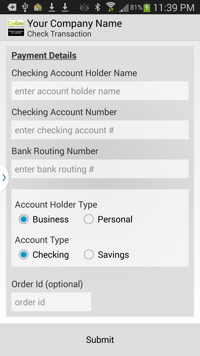 Why Should I Consider Mobile Check Processing? In working with some of our clients that collect checks in the field, we were astonished to learn that the check payments, and customer paperwork, will be stored in a delivery truck or service van, sometimes for a week or longer, before the vehicle, along with the paperwork and payment, made it back into the office where it could be processed and deposited. In between, these vehicles were often parked in high-crime areas and it was common for payments to be lost or stolen and none of the drivers or service personnel wanted to be liable for holding onto these payments. To solve these challenges, CyoGate has developed a Mobile Payments Processing Application to enable processing of both credit cards and echecks from a mobile device. With CyoGate's Mobile eCheck Processing services, the liability of storing paper checks can be completely elimiated, monies can be collected quicker, and because the transaction processes immediately, it is less likely that the payors account will have NSF at the time the check is presented. We also have advanced integration services to enable you to automatically record mobile check payments in your home office accounting system with no data entry!